Boston City Councilor Ayanna Pressley defeated longtime incumbent Rep. Michael Capuano in the Democratic primary for Massachusetts 7th District. 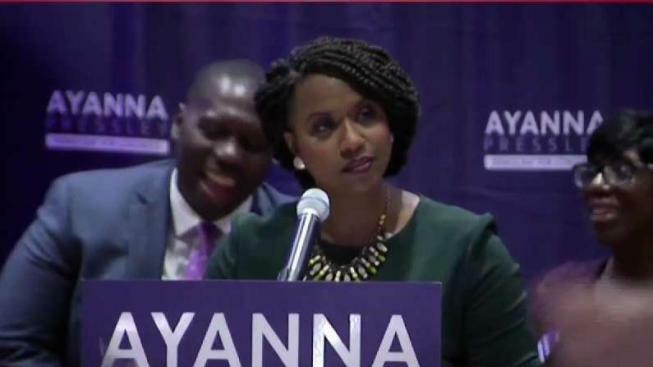 Declaring that "change can't wait," Boston City Councilor Ayanna Pressley defeated incumbent U.S. Rep. Michael Capuano on Tuesday in a closely watched Democratic primary battle in Massachusetts. Pressley is all but certain to become the first black woman elected to Congress from Massachusetts in November because there are no Republican candidates in the race. Her victory gives Democrats' progressive wing another win in their effort to pull the party leftward. "It seems like change is on the way," Pressley said in her victory speech. "I am so humbled to be standing before you tonight, victorious." She said Capuano "forced me to bring my best," and thanked him for his years of service. But she later added that "it's not just good enough to see the Democrats back in power, but it matters who those Democrats are." She also took aim at Republican President Donald Trump, calling him "a racist, misogynistic, truly empathy bankrupt man." Capuano conceded earlier, saying "America is going to be OK" and Pressley is going to be a good congresswoman. "Obviously, this is not the side we wanted to be on. Clearly, the district wanted a lot of change," Capuano said. "Apparently the district is just very upset with lots of things that are going on. I don't blame them. I'm just as upset as they are, but so be it. This is the way life goes." Democrats were quick to rally behind Pressley after her big primary night win. U.S. Rep. Seth Moulton, who was unopposed in Tuesday's primary, congratulated Pressley on Twitter "for being willing to challenge the party establishment and for building a winning movement." He said he looks forward to serving with her. U.S. Sen. Elizabeth Warren, who was also unopposed, called Pressley "a fierce advocate & powerful force for change" and said she's looking forward to fighting alongside her in Congress. House Minority Leader Nancy Pelosi issued a statement saying she looks forward to welcoming Pressley's "leadership and perspective to the House Democratic Caucus." The challenge from Pressley, the first black woman to serve on the City Council, drew some comparisons to Alexandria Ocasio-Cortez, who defeated 10-term New York Rep. Joe Crowley in a stunning upset in a Democratic primary in June. Both races highlighted rifts within the Democratic Party, with many younger voters embracing new and more diverse political leadership. Ocasio-Cortez also tweeted at Pressley Tuesday, calling her "my sister in service" and congratulating her on "continuing her historic path into Congress tonight." Capuano was considered one of the most liberal members of the Massachusetts delegation, and Pressley acknowledged she had few major policy quarrels with him. "We will vote the same way, but I will lead differently," Pressley said in a recent debate. Capuano, first elected to the House in 1998, is the second Democrat and fourth House incumbent to lose a primary ahead of the midterms. "My record is pretty clear. I'm one of the most progressive members of Congress and have been since I got here," he said in a recent interview. "I think I've effectively represented every constituent group in this district." Four other Democratic incumbents - Reps. Richard Neal, Stephen Lynch, William Keating and Joe Kennedy - also faced primary opponents Tuesday. All four defeated their challengers. Another Democrat, U.S. Rep. Niki Tsongas, is retiring at the end of this term, and the open seat has touched off a political scramble with 10 candidates on the Democratic primary ballot. That race was still too close to call and wasn't expected to be decided on Tuesday night.